Other than quiet Shikara rides on various lakes in Kashmir white water river rafting in famous mountain streams i.e. Lidder (Pahalgam area) and Sind river (Sonamarg area) is extremely adventurous. Rafting is a very recent sport in Kashmir. The best season is August to September. 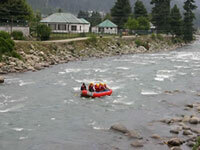 The River Lidder near Pahalgam has two short stretches suitable for white water rafting, especially for day trips. As the gradients are not steep, they are excellent for the first timers. On request full day tours can be easily arranged.